A daughter - we shan't discuss who - has commissioned a bicycle trailer for shopping, to save herself the great labour of hooking panniers on. Actually I suspect that she (correctly) divines that I like bicycle trailers, having made a number of them. Here it is, awaiting Mr. Knight's painting and lining-out, which I'm quite sure he will be pleased to do on so exquisite a piece of workmanship. Full of the conceit of thinking I know what I'm talking about, and fuller of the other conceit that anybody out there in the Wide Wide World (www.) wants to know my opinions, here they are on the topic. 1. A one-wheeled trailer is good for those conditions where one must seek a single track. Otherwise, two wheels are more stable. And unless wide handles are provided, a one-wheeler can't readily double as a handcart. 2. Twenty-inch wheels are ideal. Bigger wheels may collapse sideways under load. BMX wheels can be had with 14mm axles, and if you get the cheap ones with cup-and-cone bearings, you can winch the axle over to one side and use it as a stub axle. Big fat BMX tyres afford nice suspension. But beware ordering tyres, because there are two sorts of 20 inch wheel, and 406 (BMX size) tyres won't fit 451 (Bike Friday, Raleigh Twenty) rims. 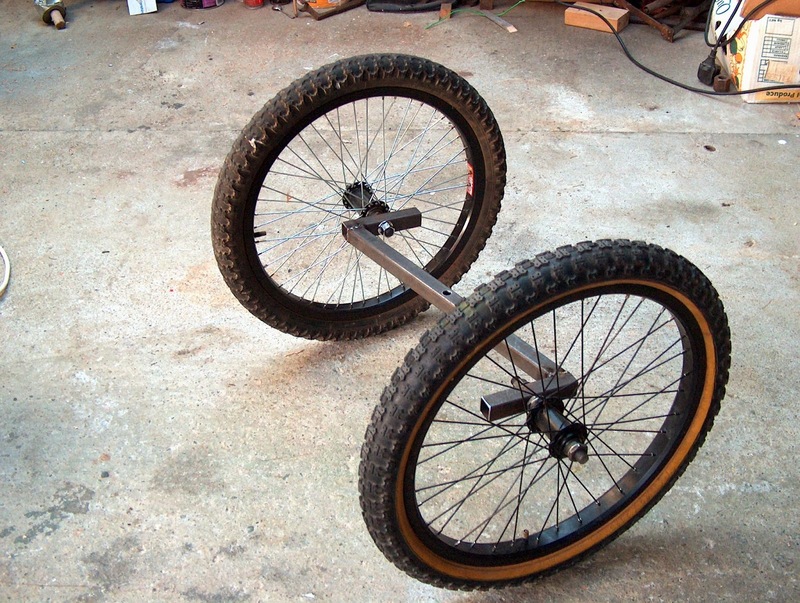 BMX wheels with 14mm axles, wound over as stub axles. Simple welded z-frame as the axle. 3. There are two sizes of sixteen inch wheel, too. 4. *uck bicycle makers are stupid. Whitworth should have been in charge. 5. Phil Wood hubs were made for wheelchairs, and may still be. They have 11mm stub axles, and won't tolerate big wheels or heavy weights. Any stub axle under 11mm will bend. 12mm or more is best. b) the tyres wear out. Very quickly. I measure between the rims with one of those telescopic lecture pointer thingies, making sure the gap between the front of the rims is the same as the gap between the back of the rims. 7. If you have stub axles, Derek Henden's Bike Hod is a fine example to ape. It has a simple hitch - a bit of hydraulic hose with a hole in it, though drilling the hole is a Mission because hydraulic hose is made of wire mesh covered in rubber, and you can't drill wire mesh. I don't know how I managed it. 8. If you haven't stub axles, a flat-deck trailer is a good design to copy. Each wheel sits between two rails. Very easy to get the tracking right. 9. You can't tighten a stub axle on box section. But it's easy to make a spacer to slip inside the box section, and then you can. 10. Overall width of 24 inches is ideal. Narrower is unstable, especially lightly loaded. Wider and it hits doorways. A standard doorway is actually 28 inches wide, but I'm so inept a bicycle-navigator that 28 inch wide trailers always bash the doorway's paintwork. I made this ages ago. At 18 1/2 inches wide overall, it was far too narrow and very tippy unladen. 11. The hitch must be in front of the bike's rear axle, or any weight in the trailer will lift the bike's front wheel, sometimes alarmingly. 12. A hitch next to the wheel axle, on the left of the bike to avoid the derailleur mech, is excellent but will need additional handlework if you ever want to wheel it round like a handcart. 13. A hitch on the seatpost is also excellent but any sideways movement of the bike exaggerates wiggling of the trailer. 14. Minimising the unsprung load is all very well, but suspension is heavy and the loads are light. Fat soft tyres work well. A sprung trailer with a sack of wheat on it set up a large sideways oscillation, and proceeded to take over the bike's steering. This had suspension, but it swayed under load, and later got converted into a wagon front axle. The wooden box for it was pretty, but very heavy. 15. Kiddy-trailers make an ideal shopping trailer. That's why you never see them for sale second-hand. Other people have other views, and will have to advertise them accordingly. Here's an inadequate photo-essay on Jane's freshly-built Shopping Trailer. Start with one of those crappy fold-up chair frames. Found, as always, on the river-bank. Reduce to component parts. The tubing is under 1mm thick, and 16mm OD. Very light. Unf. very light = very brittle, and when bending it in my improvised tube-bender (a pulley wheel and the vice) it snapped. Square off in the four-jaw two inch-sections of 2mm wall inch-section, and drill 11mm, insert spacers, and weld to a 17-inch bit of 1mm wall box-section. Phil Wood hubs are 3" wide, so total trailer width is 23". 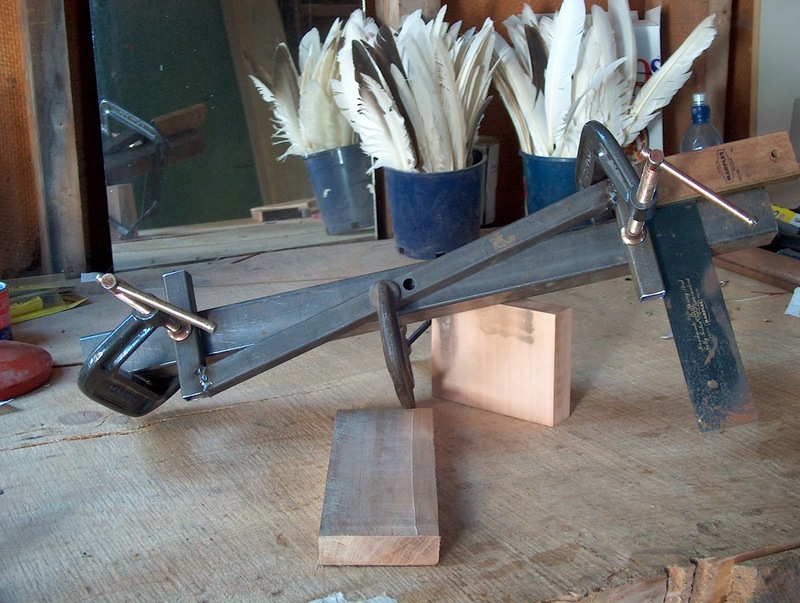 Add bits of the chair-frame only where they don't suffer any great stress. This trailer's pretty flimsy, but it's only going to take a cardboard box of groceries, and it weighs a meagre 10 lbs. Paint white, then see if it will attach to bike. Use exhaust clamps from local garage, which are cheap and plentiful. Find ancient rucksack, throw away frame, steal estate agents' sign, cut and fold into tight-fitting box, affix sides with zip ties, stuff into old rucksack. Drop the box onto the trailer. Use those elastics that you pick up from the side of the road to attach box to trailer frame. Hitch trailer to daughter's bike. I asked Jane if she was taking it with her, but learnt that it is merely for the next month's groceries. After that it becomes another Father's Shed Wall Decoration. I like the valuable information, you have provides in your article. Can you share the resource where i can buy these bike trailer or read more information. I am also looking for buying one. nice site and useful information as I want to convert a 1 wheel trailer to a 2 wheeler and the 24" wide comment will help. 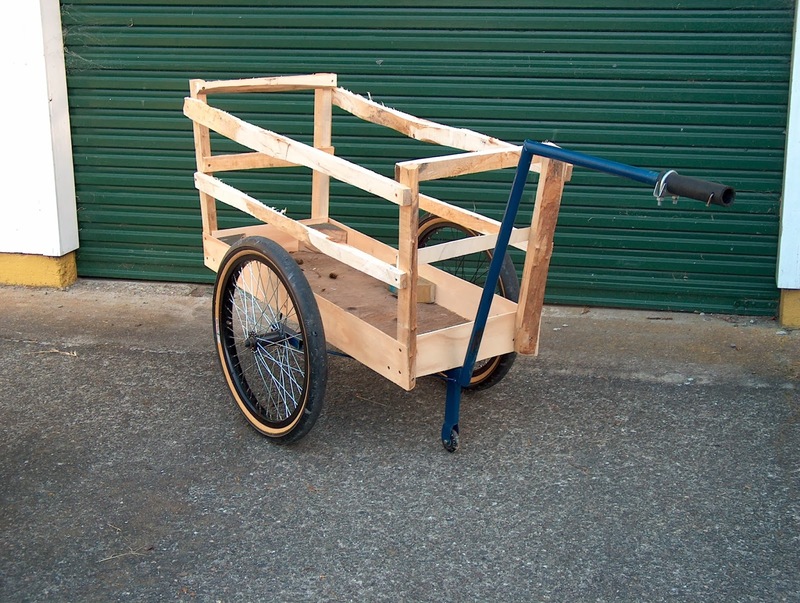 Hi I'm building a bicycle trailer, my first one, what type of tyres do you recommend, Can I use bicycle bmx wheels that need support on both ends on the trailer but only give it support from the one side like yours. Best tyres for a trailer are smooth - they don't need grip - and of large cross-section to absorb road bumps. Yes you can bolt BMX wheels from one side if the axle is 14mm - see the second photo in this post. If you clamp 10mm axles only on one side the load on the trailer must be very light or the axles will bend.